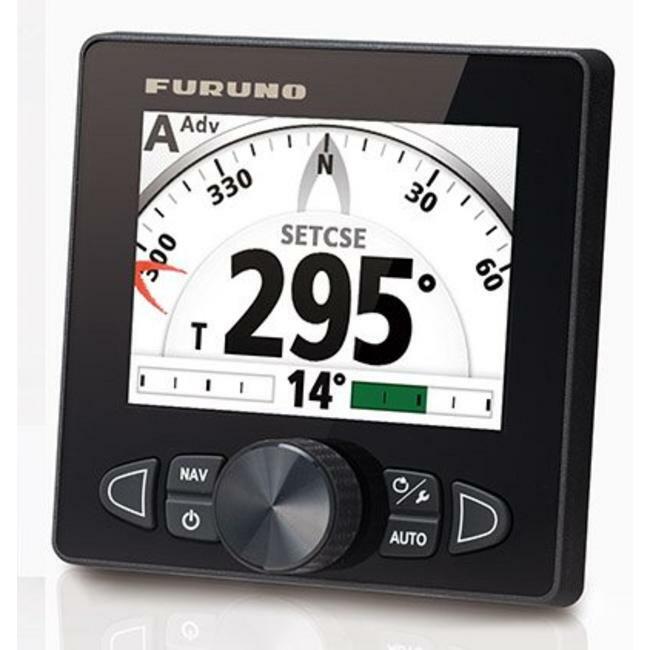 The Furuno NAVNET autopilot NAVpilot-300 is ideal for small and medium sized motoryachts and Fishery Boats because of the compact size and the new "wireless" Bluetooth GC-001 remote control with the "Gesture Control" function. The Gesture Controller is a Read more..
Furuno Autopilots and Compasses NAVnet/NAVpilot-300 autopilots with Revolutionary wireless "Bluetooth GC-001 remote control .... Press the button, aim at your destination and let go !!! 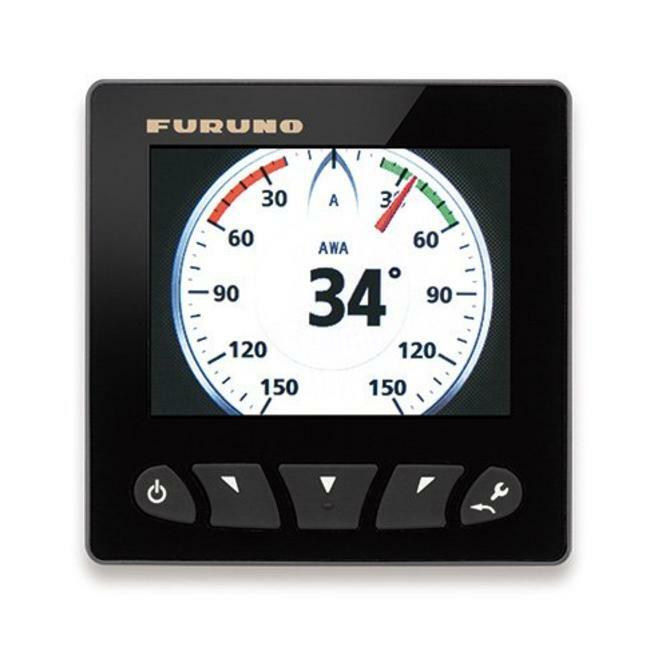 The Furuno NAVpilot-300 Autopilot is ideal for small and medium sized motor yachts and Fishery Boats because of the compact size of the autopilot and the new "wireless" Bluetooth GC-001 remote control with the "Gesture Control" function. 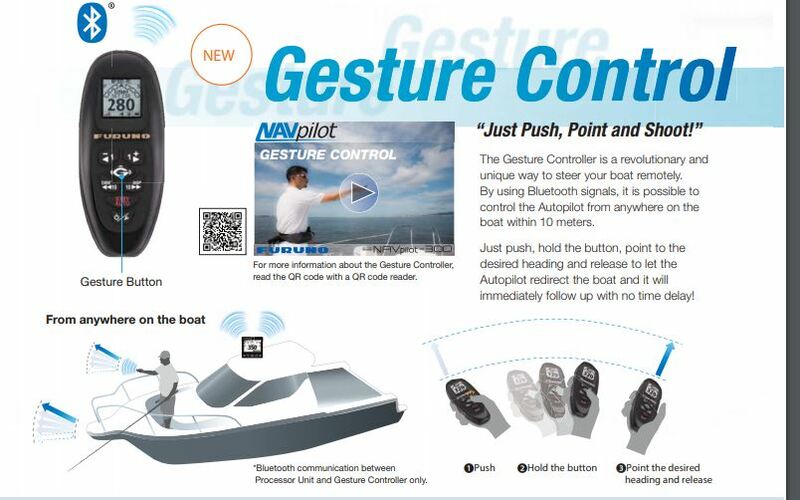 The Gesture Controller is a revolutionary and unique way to control your boat remotely. By using Bluetooth signals it is possible to control the autopilot from any location on the boat within 10 meters. Just press the button and point to the destination release the button to have the autopilot guide the boat, the destination is immediately followed without delay. This new feature was created to meet the need for simpler control and is also easy to use. The software is characterised by numerous new functionalities including the SABIKI mode. This keeps the ship perfectly on course in the case of currents and wind in the sailing direction, the stern is not put away. The NAVpilot-300 also features a day / night graphic display that offers perfect visibility anytime, anywhere. Unique self-learning and adaptive software also keeps the ship flawless on all other courses because essential parameters are constantly monitored. As a result, the NAVpilot-300 learns the ship's behaviour on the basis of sailing speeds, trim, waves, tides and wind. 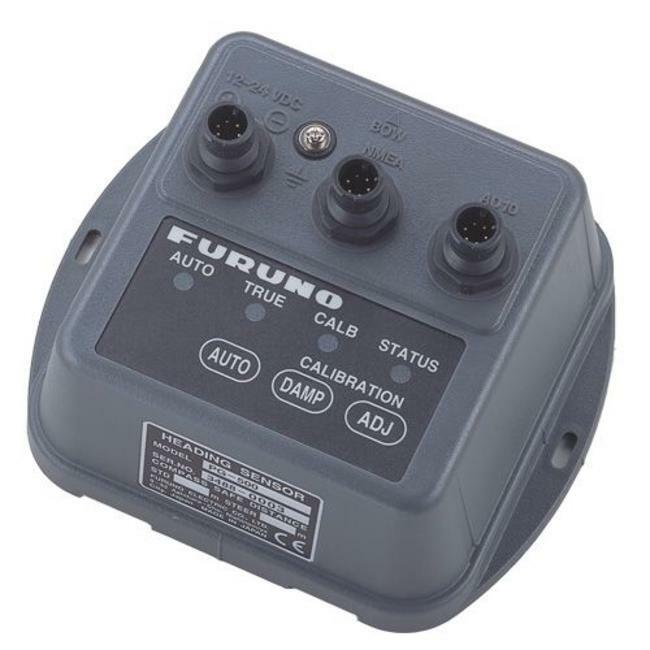 Suitable for connection to a NMEA2000 network. Self-learning software with automatic refinement of control commands. Unique "Fish Hunter" function allows specific maneuvers to be used around the specified target at a user-selected distance with automatic sailing patterns (square, zig-zag, circle, spiral and figure 8). 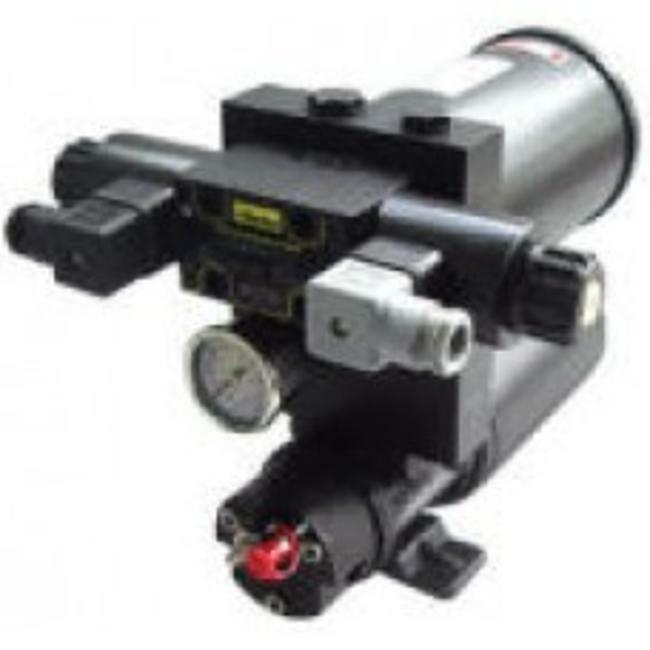 Suitable for Volvo Penta IPS, Yamaha Helmet Master, Yamaha 8LV and Seastar Optimus. Water resistant: Processor IP-55, control unit IP-56, remote control IP-67. Supply voltage: 12-24 Volt DC. Power consumption: 0.5 A maximum. * external data necessary, ask for the possibilities tel 0031 252 544772. With Fantum Feedback, NAVpilot outboard installations no longer use a physical rudder feedback unit. Fantum Feedback is a menu-selectable feature available in the latest NAVpilot-300 and NAVpilot-700 series software. This software has been developed and extensively tested on a wide range of outboard ships with hydraulic steering and reverse pump operation. Fantum Feedback ensures accurate steering control, from slow drag speeds to high-speed cruising, using a newly developed gain process, instead of traditional rudder-angle-based controls. The new NAVpilot-300 is very easy to install via the pigtail cables that provide power, NMEA2000 network and pump power. Furuno's Fantum function makes a physical rudder position indicator unnecessary. 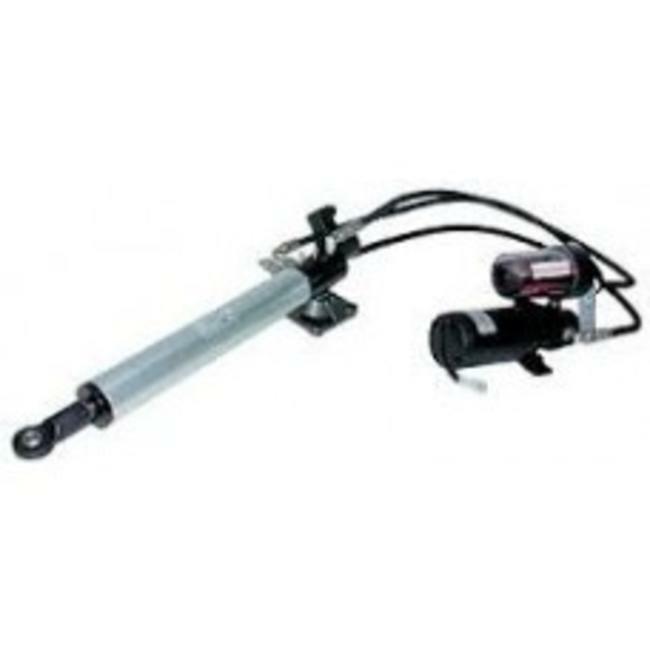 It clears the way to a simplified installation and improved Steering control! 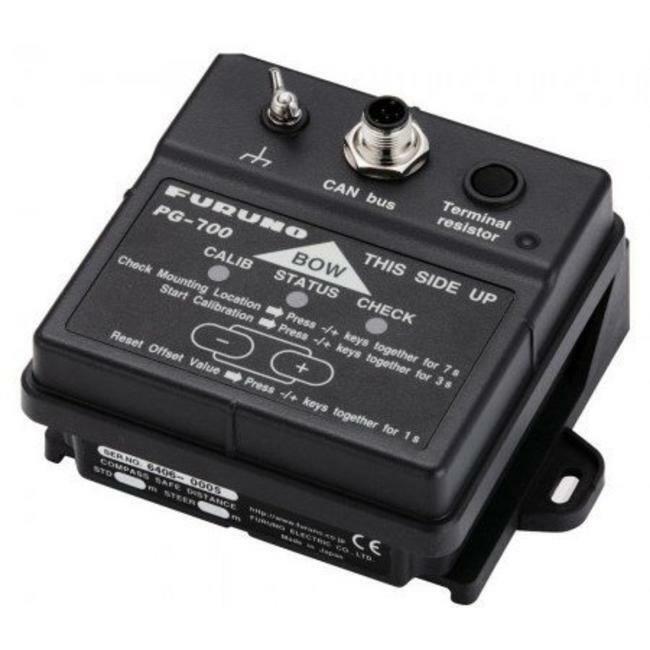 FURUNO PG-700 The PG-700 is a rate compensated heading senso..
FURUNO Navipilot 711C Autopliot Perfect for inboard or Outbo..
FURUNO PG-500 Fluxgate compass SENSOR is an inexpensive magn..
FURUNO FI-70 data organizer Simple setup for powerboats and ..
FURUNO HydraulicLinear Drive 32ST16 NEWAVE for Autopilot 12 ..